Explore ancient seaside villages along the Italian Riviera's rugged coastline on this private Cinque Terre trekking tour. Stroll among the vineyards as you explore centuries-old settlements including Riomaggiore, Groppo, Manarola and Vernazza with your private guide. Hear of the villages' history and winegrowing heritage, and discover top attractions along the way such as the Via dell'Amore and the 14th-century church of Our Lady of Health in Volastra. Enjoy panoramic views over the Italian coastline as the azure-blue waters of the Ligurian Sea sparkle in the distance. I can't say enough good things about our trek with Pall. If I could give him 50 stars instead of 5 I would! Pall was great and I highly recommend this experience. Pall took us on trails we never could have found ourselves. In addition he has a wealth of knowledge regarding Riomaggiore and the surrounding area. We walked through and around hillside villages that are not even mentioned in most of the travel information on Cinque Terra. I was glad we booked this hike on our first full day in Cinque Terra. By doing so Pall was able to answer many of our general questions and this gave us a good lay of the land so we could plan our stay accordingly. You do need to be prepared for a full day of hill hiking. Eat a hearty breakfast since you start early in the morning and stop late for lunch. Beautiful scenery, information, good company and a workout: what more can you ask for! This tour is a must! Pall is an amazing guide with close ties to the area. The trek was invigorating and the sights were incredible. It was a wonderful way to explore the region and we learned a lot as well. The tour was supposed to be a private tour with flexibility suited to us. It wasn't. It was all about what the tour guide wanted to do. We expected a lovely glass of wine at least somewhere along the way, a nice leisurely lunch, and certainly a couple of bathroom breaks. Rather by the time we finally got to a restaurant and restroom we were desperate! The scenery was great in spots but the hike itself did not match the description. In order to see one of villages we had to take the train on our own after dark from Riomaggiore! We thought we'd get to see a bit more than two of the villages. Riomaggiore was lovely but we felt cheated out of the other villages. We loved this tour because we got to see the back country off the beaten path! Our guide was exceptional with lots of information and insight into the area and it's population. We enjoyed being away from the crowds and to see how the locals live! This was one of the best tours we've ever taken. Pall was absolutely amazing. After a few hours it felt like we were going for a long walk with an old friend. The BEST part of he tour was learning about the history of the area and how it was founded. For us, this was more of learning tour than a sightseeing tour. We took some AMAZING pictures, but we're not going to post them... We'd advise you to experience Cinque Terre in PERSON... With Pall! This was a superb introduction to the area and teaches one respect for the area and people. Pall was extremely knowledgeable about the people, terrain and area. He really brought it all to life. He measured the walk according to that which our party could comfortable manage and when looking back we were incredulous how far we had actually come and how high we had been at times with what felt like a mild stroll. I will be talking about the walk for a long time to come. 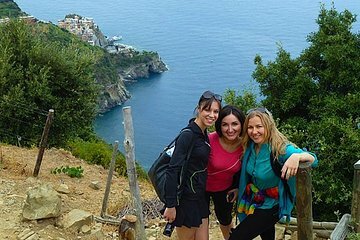 If you want a personalized, awesome hiking experience in the Cinque Terre you can do no better than Pall. An American ex-pat from the Notheast he has lived and breathed this area for 16 years. You won't do any better. I honestly didn't expect Pall to be able to deliver according to his reviews, which were stellar. But he has been doing these tours for 7 years and he lives in Rio Maggiore. He knows the locals, he has heard stories directly from them, and he has been accepted within the community. This tour is special for three reasons. First, it's private. You don't have to hang out with 20 strangers, and the low number allows Pall to focus on you and create an experience just for your small group of friends. Second, if you don't know the Cinque Terre, there are a lot of trails and the main ones can get crowded. We passed maybe 10 people all day. Pall knows the back ways around CT and there were some breathtaking views. Third, Pall is a machine for learning. He will tell you about local government, stories about his neighbors and the community, the history of the area while he has been giving tours for 7 years he has lived there for 16, and local vegetation and wildlife. He even gave us a tip on a Michelin star rated restaurant in the area that was incredible, and recommended checking out Porto Venere for something outside of CT to do, which was a great experience. He was talking for 8 straight hours, all while hiking! There is a bit of hiking, but Pall tailors everything to his group. We put on 10 miles of hiking, but he mentioned that we could have taken some buses if we were tired. It takes me 5 minutes to size up how I should handle a group, He said. And he did a great job of doing that too. This was my favorite thing we did in our 9 days in Italy and I couldn't recommend it highly enough.